Premiership Musings with Neil Ryan and Ally Murty. Arsenal, in rather atypical style, finished an amazing week for the club by dominating an Everton side in front of their raucous home support. Giroud, returned to the starting line-up after his goal against Bayern Munich midweek, was rampant here in a fantastic display of attacking football. His physicality allowed Arsenal to play a more direct game then they are used to with Mesut Ozil finding him in the box with an absolutely amazing cross for him to flick over Howard’s head. 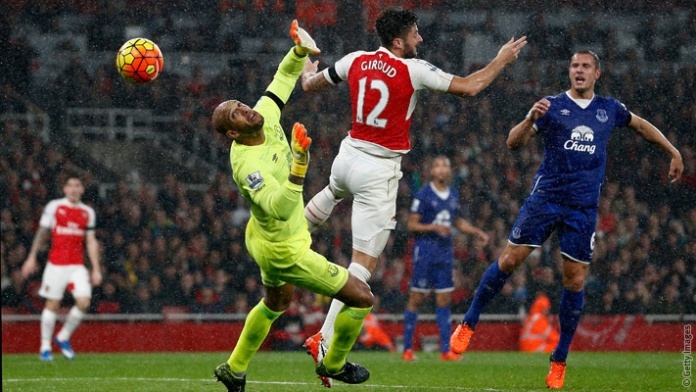 His work rate lead to Arsenal’s second in as many minutes, winning a free kick on the edge of Everton’s box. Carzola’s ball was played towards him in the far post, drawing the attention of the attending defenders and allowing Koscienly to head into the back of the net. The performance of both Giroud and Walcott will give Wenger a sense of hope that they might finally be crowned champions in May. A first half red card rather ruined the first Tyne-Were derby of the season with Coloccini giving his marching orders after being judged to have obstructed Steven Fletcher in the box. Many will say that the card was harsh but he did take out Fletcher, considering his usual finishing ability he would have been safer allowing him to shoot unimpeded. Sunderland used the man advantage well but Newcastle did play far better than they have in recent weeks and show some signs of becoming a competent team at some point in the future. For Allardyce he continues the fairly ridiculous form of a Sunderland manager beating Newcastle in his second game in charge. It will be interesting to see if he is able to turn things around in the north east, Sunderland are a club with too many diehard fans for their team to continue to play as poorly as they have in recent years. In a battle between two of this year’s most surprising teams Leicester City continued their fantastic start of the season, in particular the impressive Jamie Vardy. Vardy, now top scorer in the premiership, can dream of starting for England in this summer’s European championship. He is playing the football of his life, dominating opposition defences throughout the league. His tenacity must be rewarded by Roy Hodgson this summer as, at the moment, he seems a much better fit for England than a struggling Wayne Rooney. Tipped as the “most expensive game in Premier League football”, Manchester City had the chance to return to the top of the table following Arsenal’s hard-fought victory against Everton the previous evening. It was a tale of 2 defences as for the best part, the rival’s generally negated each other. The introduction of Jesse Lingard sparked some life into the game as the youngster and Smalling came close. But it wasn’t to be as the match ended goalless; the first time since 2010. Slaven Bilic continued his ridiculous form against the traditional powerhouses of English football, his side completely outplaying a fairly deplorable Chelsea who have been in freefall for so long that they may have finally hit terminal velocity. Jose’s petulance knows no bounds as he was sent to the stand at half time for apparently attempting to enter the referees changing room at the interval. His moody expression and constant knack of making things worse for himself is not helping his team at all and, at the moment, it looks unlikely that he will last till the end of the season. For West Ham this season might grant them a real chance of ending the season in a European place before their move to the Olympic stadium. If they can it may herald a new dawn for The Hammers. Liverpool still look like a side struggling for confidence and creativity in Anfield as they looked to give their new manager his first win of the season. Benteke looked like he had given it to Liverpool with an excellent header in the dying minutes of game. The big Belgium is struggling for fitness after coming back from a hamstring injury and it will be interesting to see how he fares under Klopp. Liverpool’s lack of fit strikers is certainly hurting them at the moment and Klopp will know that he cannot expect too much of this team yet. The young Origi looks age and, if not for the previously mentioned injury problems, it would be difficult to see him continue with his starting position. Previous PostRory McNab gives his view on whether Wenger’s current crop is at all comparable to 2004’s greats.